The only thing for certain in the stock market is there will be ups and there will be downs. When you compare the Bank On Yourself method to stock and mutual fund investing strategies, you’ll realize that there are absolutely no guarantees that the market’s performance will match up with your expectations. You’ll always be in for some surprises. And there’s a dirty little secret Wall Street doesn’t want you to know: Studies show that the average equity mutual fund investor has earned only 3.79% annually for the past 30 years, beating inflation by only 1% a year. 1. Do you receive a guaranteed increase every year? Plans receive a guaranteed increase every year – your statements always have good news, and no ugly surprises. 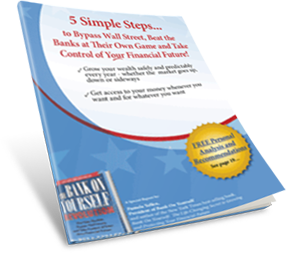 During 2008, the third worst in history for the stock market, the policies used for the Bank On Yourself method received their contractually guaranteed increase, plus a dividend. See an example here of how one of these policies grew in 2008, while the stock market plunged. There are no guarantees that your money will increase in any given year. Wall Street lost over 49% of the typical investor’s money – TWICE – just since the year 2000. Do you know for sure that’s not about to happen again? Investors have no way to predict the value of their investments at any given point in time. Over the last 85 years, the Dow was in a stall that lasted 12-25 years 65% of the time (as the stock market timeline charts also reveal). 2. Is your principal protected during a market correction? No loss of principal when there is a market downturn. You can lose part or all of your principal in a stock market correction. 3. Are your gains locked in during a market downturn? You can lose part or all of your gains in a market downturn. 4. Are your results dependent on luck, skill, or guesswork? You don’t need to pick the right stocks, funds, real estate or other investments – Bank On Yourself lets you focus on other, more fun things and worry less. Imagine not having to know the best way to invest money. Before you decide to move forward with a policy, you can know your guaranteed minimum annual increase, and the minimum value of the plan in any given year. Results depend on picking the right stocks, funds or money managers. 80% of all mutual funds and 80% of all investment advisory services underperform the overall market over the long term (Source: Hulbert Financial Digest). 5. Does your money grow more efficiently every year? 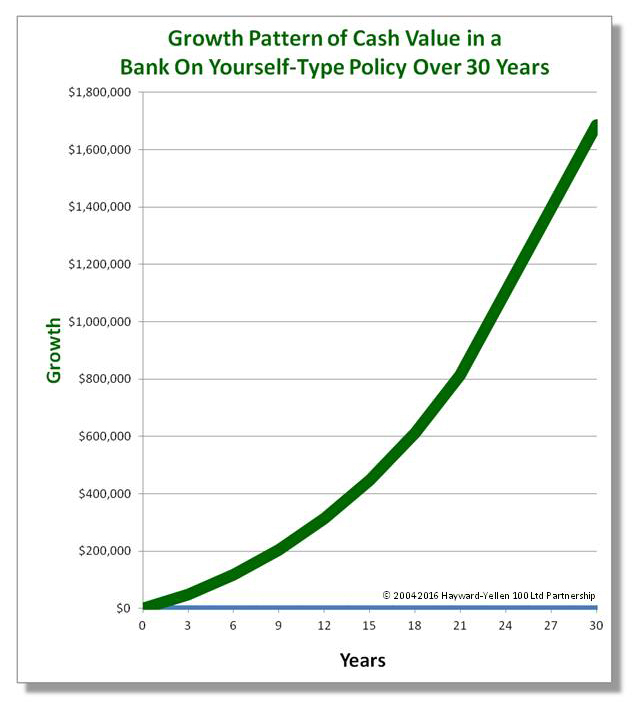 The growth in the policies recommended for Bank On Yourself is both guaranteed and exponential (the growth escalates by ever increasingly higher amounts). Note: Your cash value is guaranteed to be equal to your death benefit at maturity, and your death benefit increases due to the little-known riders included in a properly structured Bank On Yourself-type policy. However, no two Bank On Yourself policies are alike – each one is custom-tailored to the client’s unique situation. To find out your bottom-line results if you added Bank On Yourself to your financial plan, request a free Analysis here. Money invested in the stock market grows unpredictably, can stall for lengthy periods of time, and can plunge just when you planned to tap into your funds. 6. Can you use your money without selling your assets? You can borrow the equity or cash value in your policy (without selling any assets) and your plan could continue to grow as though you never touched a dime of it, because a handful of companies offer policies that receive the same guaranteed annual increase regardless of any loans, and any dividends you may receive are not affected by loans. This feature is not offered by all insurance companies, so work with a Bank On Yourself Authorized Advisor who knows which companies have policies that meet all the requirements to maximize the power of the concept. To get access to your equity, you typically have to sell your assets, and you stop getting the interest or investment income they provided. 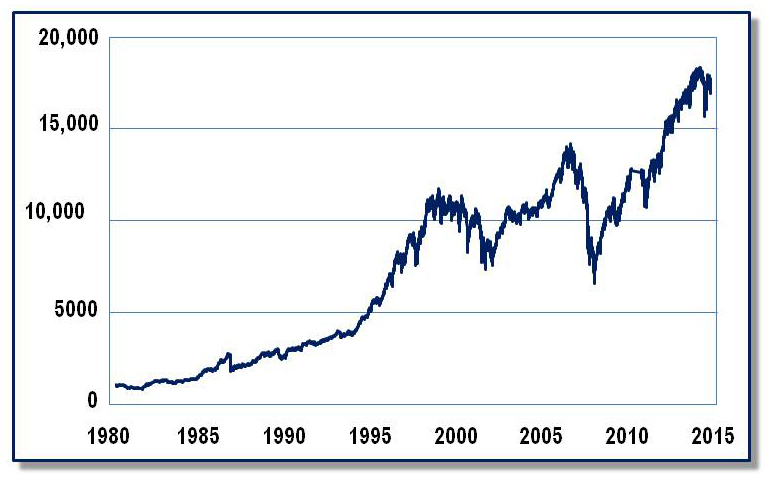 If you have to liquidate assets when the market is down, you’re breaking Rule #1 of Investing (“buy low, sell high”). 7. Can you rely on it for a predictable income at retirement? You can know the minimum annual income you could take from your policy, and for how long you could take it, so you don’t have to pin your hopes for a secure future on luck, skill or guessing games. Any dividends credited to your plan, on top of your guaranteed annual increase, would increase the amount you could take from your plan. The Bank On Yourself Authorized Advisors only use companies that have paid a dividend every year for at least 100 years. There is no way to predict the value of your investment in 10 years, 20 years, or on the day you hoped to retire. The market can crash just as you’re approaching retirement, or after you retire, and undermine your best-laid plans. 8. Does it “self-complete,” so your family or heirs also receive the money you had planned to save? Provides an income tax-free death benefit, providing peace of mind for your family or heirs, if you were to pass away. If your loved ones have no need for the money, it can be left to your church/temple and/or favorite charities. This benefit could be many times more than the current cash value of the plan at your death. Only the current value of your investments would go to your loved ones. With the exception of Roth plans, taxes would be due and leave your loved ones with far less money. 9. Are your assets protected from creditors and lawsuits? Both your cash value and death benefits may be protected from lawsuits and creditors in many states (check with legal counsel to see what applies in your state). Money invested outside of certain qualified plans does not enjoy protection from lawsuits and creditors.